Even though the stock market is struggling, Greg Nance thinks it has a lot to offer— not only investors but also local high school students who want to learn about saving and investing, money and finance. 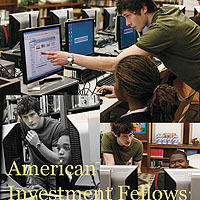 Last September, Nance, a second-year student in the College, co-founded American Investment Fellows to tap the potential educational benefits of the stock market for at-risk high school students through classroom curricula and extracurricular investment clubs. The program offers hands-on experience in creating and managing mock stock portfolios. Inadvertently, Nance’s timing could not have been better, given all the interest in the market generated by the current economic downturn. “It’s a really hot topic now,” he said. Nance’s goal of teaching inner city-youths investment literacy, critical thinking, basic mathematical analysis and public speaking skills is beginning to take hold at the School of Leadership on the South Shore Campus. Since January, Nance and other University students have led weekly discussions about stocks and finance in two of Matt Hay’s upper-level economics classes at this small Chicago public high school, which opened in 2003. Two or three mentors work as a team in each class. “This appears to be a good program because it’s increasing the knowledge and aspirations of students at our school, which does not have as many resources as some other schools,” Hay said after a recent session. Nance, who is considering a career in teaching, has called numerous high school principals, offering classroom sessions or an investment club. Many are not interested or are worried that the program will be unaffordable. After Nance explains that it’s free, “they lighten up,” he said. As a result of his cold calls, Nance expects to have two more high schools on board in the near future. Meanwhile, he has more than 15 University students lined up as mentors. Through class sessions and investment clubs, he hopes AIF will generate yearlong relationships between the high school students and college mentors. Although he says he enjoyed a privileged upbringing in Bainbridge Island, Wash., Nance remembers being unmotivated in grade school, especially in math. That changed, however, after his sixth-grade class began studying the stock market. Nance supplements his AIF activities with participation in a student group called The Blue Chips. This student investment club manages approximately $100,000 of the University’s endowment, providing members with a forum for expanding their knowledge of finance, investing and business. Nance has ambitious plans for AIF, including setting up a Web site, developing competitions between the high school investment clubs and securing free copies of Investor’s Business Daily for the students engaged in the program. Also, he hopes to be able to pay AIF mentors, expand to other cities and offer two-day investment camps around the country this summer. Nance is drafting grants to help fund the expansion and hopes corporate sponsors can provide real money for high school students to invest. Back at the School of Leadership, Hay thinks the AIF classroom sessions, which run for 10 weeks, might spawn an investment club. “That would help students prepare for the real world and build their confidence for managing their own money,” said Hay. “And we might be able to open up such a club to the other three schools on the South Shore Campus.